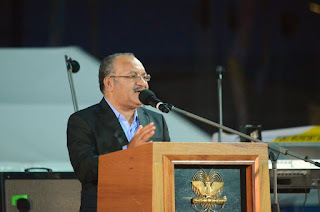 Prime Minister Peter O'Neill has congratulated Team Papua New Guinea for their outstanding performance, and extended the Government's Games cash incentive to include all team athletes who did not win a medal. Speaking at the post-Games team celebration at Sir Hubert Murray Stadium on Monday night, O'Neill highlighted the hard work of each athlete. "We know the sacrifice each one of you have made to perform the very best for the nation and our people," the Prime Minister said. "We must continue to support you. "The Government has made a decision that we will give all non-medal winners two and a half thousand Kina each to support your training. This will allow each participant to travel home and meet their expenses. "Some people do not understand but they are few in numbers. You have eight million people behind you and they see what you have achieved. "We will not stop there but we will expand on what we have already built. "I can assure you that our High Performance Program will continue and we will put more money into making sure you get the best training possible. "You must continue to use our facilities and do it every weekend so they are not wasted. "Please continue to train hard and know that your Government will continue to invest in sports in our country." O'Neill told the athletes that through their efforts at the games, they can see what is possible and reach for their dreams. "This is just only the beginning for you and many of the thousands of young men and women, who are going to come after you. "You have made us very proud of your achievements. Thank you on behalf of our country, you have lifted the pride of our nation through your performance. "Through your presence and participation you have made us all very proud. "You have shown the world, not just the region, that Papua New Guinea can do anything we set our mind to. "Our young population is demanding that we build the greatest nation." O'Neill also challenged the team to achieve the same result they achieve at the XV Pacific games in four years' time in Tonga with the Government's support. Prime Minister Peter O'Neill has praised organisers and teams for the most outstanding Pacific Games in history, and said while the road to Games was not easy it was a very good decision. "Last night (Saturday) we thanked the best athletes of our region for their outstanding performances over two weeks of competition," O'Neill said. "We saw the best of our athletes and Papua New Guinea won our home games. "People around the nation are filled with pride and a heightened sense of national unity. "In the fortieth anniversary of our country as a state, the outcome of the Games is a wonderful achievement. "I congratulate our super-fish, Ryan Pini as the best male athlete of the Games. "Eighty-eight gold medals and two hundred and seventeen medals overall is outstanding. "Forever our country will remember these past two weeks for their heroics, for the outpouring of national passion and for the strengthening of bonds with 23 other countries in our region. "Thank you Papua New Guinea for getting behind our Games." Upon reflection, the Prime Minister said proceeding with the hosting of the Games was one of the toughest decisions the new Government had to make when it came to office in 2012. "When we formed Government we were faced with an enormous challenge when it came to the Pacific Games," the Prime Minister said. "Papua New Guinea had earlier agreed to host the Pacific Games, but there had been no planning to get us to July 2015. "There were no usable facilities and no budget identified to build or refurbish existing facilities. "The months earlier had been lost to political challenges, but with a clear mandate at the election we now had the chance to properly govern and to make plans for our country. "I was given the options by our officials and there was a simple decision that had to be made. "We had to either proceed and spend millions of Kina on developments in a very short period of time, or to quit and walk away. "Papua New Guinea is not a nation of quitters so I gave the order to proceed with the Games. "I appointed Justin Tkatchenko as the Minister responsible as I knew he would get the job done, and for three years everyone worked so had to deliver. "Seeing the success of the Games, the infrastructure that we now have and the way the Games were promoted around the world, I know that proceeding with the Games was the right choice. "Hosting the Pacific Games was a tough decision and it was worth every toea. "Papua New Guinea has demonstrated that we can host major events and do so in a professional and financially responsible way. "We have built the required infrastructure that will now be used at major events including the Pacific Islands Forum Leaders' Meeting, the FIFA Women's Under 20 Word Cup, APEC in 2018 and I hope the Commonwealth Games in 2026. "We have a lot to be proud of in Papua New Guinea as we bring the world to our shores." 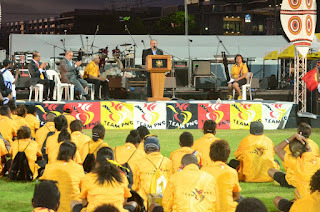 Prime Minister Peter O'Neill has praised athletes and members of the public around the nation for embracing the XV Pacific Games. O'Neill said the national spirit and goodwill around the games is a wonderful feeling that will go down as a great highlight in the nation's history. "This is a proud time to be a Papua New Guinean!" the Prime Minister said at the half-way point of the Games. "We have thousands of visitors from around the Pacific sharing our home and together we are competing in a spirit of unity. "I have seen many thrilling contests from athletes at the peak of their careers from all Pacific nations. "Our visitors have praised the hospitality of Papua New Guineans and they have been made to feel so welcome. "I thank all Papua New Guineans for demonstrating to the regional and the world the warmth of the nation." The Prime Minister said the facilities built for the Games have proven their capacity and would serve athletes from Papua New Guinea and the region for decades into the future. "We have world class sporting facilities now in Papua New Guinea," he said. "Young children watching the Games with sporting dreams will one day train and compete at these stadiums, pools and courts. "I again congratulate everyone who has worked so hard in the last few years to deliver these Games. "Lets continue to get behind our athletes, and our competing nations, to have a great final week of the Games. " When asked about the Opposition Leader's ongoing criticism of the management of the Games, O'Neill said now is not the time for politics. "People right around the nation are embracing our team, cheering our wins and supporting our athletes no matter where they finish. "Lets enjoy the Games in the spirit it is intended and be part of this wonderful exhibition of sportsmanship and friendship. "Please be a proud Papua New Guinean and not a complainer. "This is a time for our nation to celebrate and to shine." Chairman of the 2015 Pacific Games Police Security Operations acting Deputy Commissioner Administration Jim Andrews is confident that Papua New Guinea will deliver a safe, secure and incident free 2015 Pacific Games. "I know we are just only three days into the 2015 Games but the genuine support, commitment and cooperation of our people have been incredible," Andrews said. He thanked all members of the organizing committee for their support and cooperation and the government for its support in funding. "I want to thank commander of the security operations for the 2015 Games Chief Superintendent David Manning and committee members for their support and tireless efforts." Andrews said planning began in early 2013. "Despite many challenges, we have managed to peacefully welcome the opening of the games and are now going into the first three days of the games. "It's our responsibility as police officers to provide security for the games so that participants and supporters from other sister countries can fully enjoy the true spirit of the 2015 Pacific Games without encountering any problems. "I also want to extend my appreciation to the venue commanders and members of the Royal PNG Constabulary the PNG Defence Force, Correctional Service and other state agencies for their dedication and commitment to come together to achieve this early positive result. "I am confident of positive outcomes in as far as security and safety for our visitors is concerned," Andrews said. 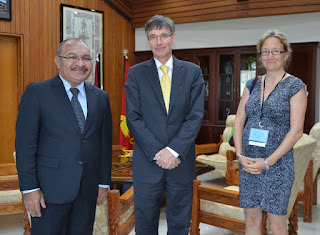 Prime Minister of Papua New Guinea Peter O'Neill has thanked the outgoing Head of Delegation for the European Union, Ambassador Martin Dihm, for his support to the nation during his appointment. Ambassador Dihm will complete his posting to Papua New Guinea in July after four years in the position. O'Neill said Ambassador Dihm has helped strengthen relations between Papua New Guinea and the European Union on a number of issues. "During Ambassador Dihm's posting to Papua New Guinea we have seen in increase in trade and investment, and a strengthening of cultural relations with Europe," the Prime Minister said. "I thank Ambassador Dihm to his contribution this increasing engagement with Europe." The Prime Minister said there have been sensitive issues between Papua New Guinea and the European Union in recent years, and the EU mission in Port Moresby has worked with the Government to overcome challenges. "The implementation of the Interim Economic Partnership Agreement and the dialogue on compliance with the EU regulation on fishing are progressing very well. "The iEPA has created over 30,000 direct jobs, many of these being for women, as well as many more indirect jobs. "The ongoing dialogue covering illegal, unreported and unregulated fishing continues to move forward and we expect to have further positive news soon. "Papua New Guinea will also continue to widen and deepen the list of tradable goods that we export to Europe. "This will move from canned tuna to include other products like coffee, cocoa, coconut, minerals, processed timber and petroleum products. "Papua New Guinea also appreciates the ongoing technical support that we receive from the EU and we recognize the important partnership that we have with Europe. "I wish Ambassador Dihm our country's best regards for his future appointments and trust that he will remember his posting to Papua New Guinea with great fondness." The Prime Minister received the courtesy call form Ambassador Dihm on Tuesday, 7 July 2015. Prime Minister Peter O'Neillhas welcomed the decision by Total S.A. and joint venture partners to proceed with the Papua LNG project. Negotiations will now continue to ensure that gas not only derives export income, but also provides strong direct input to economic development through downstream industries and electricity production. "The third train of LNG is the next major economic development project for our nation, and will employ ten thousand workers in the construction phase," the Prime Minister said. "Most of the workforce will be Papua New Guinean, and as we saw with PNG-LNG construction, will provide a major boost to skills and capacity in our workforce. "We have to keep moving forward with the next phase of this project, as agreed with the Total and partners, so that we reach project milestones on time and the economic benefits of the project can be realized. "Very importantly there will be ongoing negotiations to ensure clear national benefits from each stage of the process are shared with Papua New Guineans. "We have to ensure that the people of Papua New Guinea have the opportunity to utilise our gas for domestic economic activity. "A national petrochemicals industry has great potential for our nation, and we want to improve our own energy security by using more of our gas for power generation." The Prime Minister said there will be a number of announcements made by joint venture partners in the coming months as they continue to complete surveys and analysis on specific construction items. "The next two years will see work underway that will include social mapping and land identification studies, societal impact assessments, and the finalization of construction requirements. "The Government stands ready to move ahead with preparatory work, including ensuring regulatory requirements are met and processed, and environment studies are undertaken. "There will be further clarification of arrangements between the project and the Government, and the marketing of Papua LNG will be underway. "The gas from the Elk-Antelope field is high quality and despite current global energy prices, by the time Papua LNG reaches the market it is anticipated energy prices will have improved. "Our proximity to the constantly growing Asian market also places Papua LNG in a very strong competitive position." 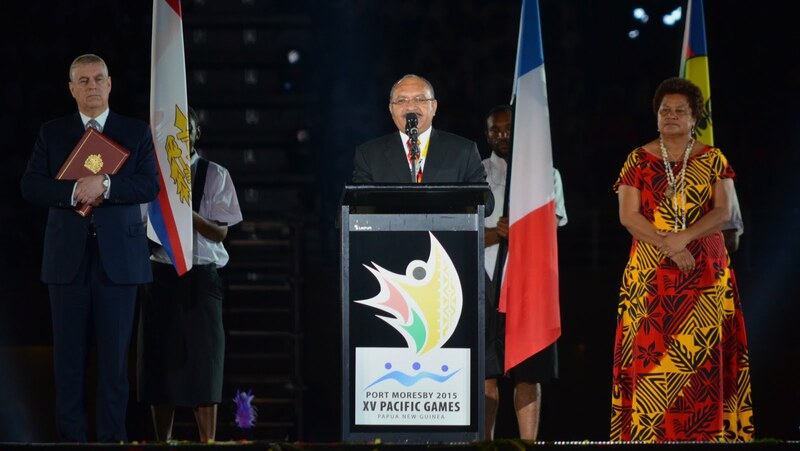 Prime MinisterPeter O'Neill CMG, MP, has praised the organisers and the "grassroots stars" of the Opening Ceremony of the XV Pacific Games in Port Moresby. 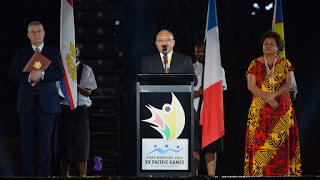 >l O'Neill made the comments following the start of the Pacific Games that brought together 3,500 performers from around the nation, who set the scene for the arrival of more than 3,000 athletes into the stadium. "The opening ceremony performance set a new standard for major events in Pacific nations. "When the athletes of our region entered the stadium it was an extremely proud moment that sports men and women of all participating countries will never forget. >l "The sporting facilities that we have built for these games are world-class, and they will continue to benefit our region for generations to come. O'Neill urged all participants to enjoy the games and make many great memories. 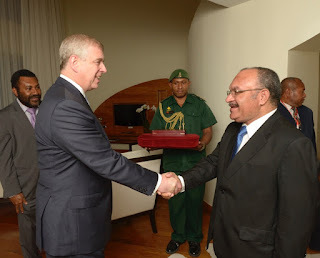 Prime Minister of Peter O'Neill has thanked the Duke of York, HRH Prince Andrew, for visiting Papua New Guinea and opening the XV Pacific Games in Port Moresby. "Papua New Guinea appreciates the visit by the Duke of York and the time he has taken to meet many people during the days he spent with us," O'Neill said. 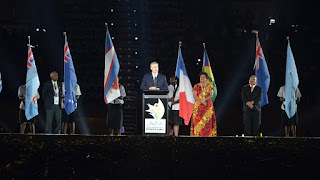 "It was also appreciated that Prince Andrew was able to formally open the Pacific Games after having performed the same duty when Papua New Guinea hosted the Games in 1991." The Prime Minister said his meetings and discussions with the Duke of York were enlightening, and he appreciated Prince Andrew's interest in the future development of Papua New Guinea. "Prince Andrew has a deep understanding of Papua New Guinea, and was most interested to learn more of our nation's ongoing development. "We had the opportunity to discuss the economic growth of Papua New Guinea, and how we are expanding service delivery to our people. "Our ongoing programs to expand education and healthcare are changing lives and opening new opportunities, particular for people in rural areas." The Prime Minister said Papua New Guinea has seen significant advancement since past royal visits. "Papua New Guinea has changed a great deal since Prince Andrew last visited in 1991," the Prime Minister said. "It is less than three years since the last Royal visit when Prince Charles came to Papua New Guinea, and even over that time the infrastructure in Port Moresby and around the country has seen great development. "I appreciate Her Majesty the Queen accepting our request for a member of the Royal Family to visit Papua New Guinea for the opening of the Pacific Games. "I hope the Duke of York has enjoyed his visit and the opportunity to meet with many Papua New Guineans from all regions and different walks of life." The people of Papua New Guinea welcome to our nation, and our capital city, visitors from our 24 Games nations. 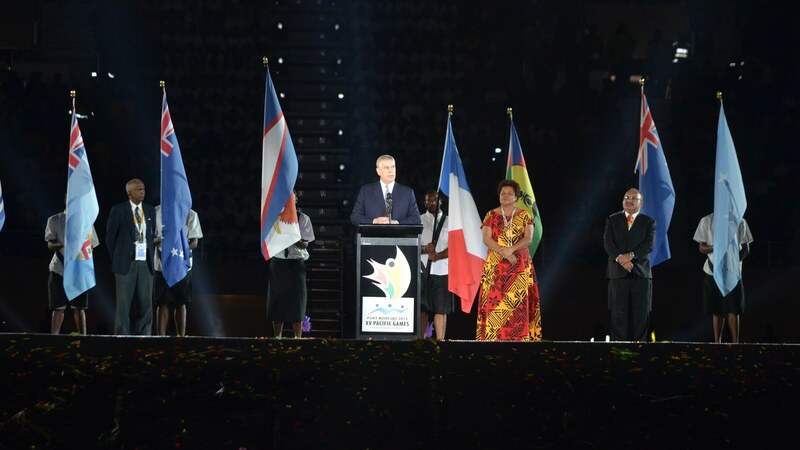 We also welcome Your Royal Highness, the Duke of York, to once again open the Pacific Games in Port Moresby. I know that these Games will be the best ever and many new records will be set. The sporting facilities that we have built for these games are world-class, and they will continue to benefit our region for generations to come. They are also a demonstration of the change that is taking place, and the new standards that are being set in the Pacific. Today we are living in the Asia-Pacific Century - with global economic growth and development centred on our part of the world. This is a great time to live in the Pacific – we have a great future ahead of us. The Pacific Games brings together over 3,000 athletes participating in 28 team and individual sports. But the Pacific Games is about more than a sports competition. It is all about people – about the athletes, about the coaches, the officials and millions of supporters all around the world watching these Games. The Games bring our vast region together and builds strong bonds between people, between teams and nations. On behalf of Papua New Guinea and its citizens, thank you to the Games Organising Committee and the very strong sponsors of these games. But more importantly, let me thank the thousands of volunteers, thousands of workers and officials who have worked very hard over the past three years to make this Games a success. Please enjoy the Games and please make many great memories out of it. I hope all visitors experience the warmth of the welcome my fellow citizens will extend to each of you. Good luck to the athletes from every country – please make us all proud. Prime Minister Peter O'Neill launched a 25 megawatts power supply from the ExxonMobilLNG Plant to Port Moresby yesterday. In his address celebrate the switching on of power, he said the additional 25 megawatts of electricity would meet demand in Port Moresby with an increased 50 megawatts capacity to be added later this year. O'Neill thanked everyone involved in the project that was delivered in five months after the signing of an MOU with ExxonMobil PNG in January 2015. He also thanked the provinces and governors' who supported the Government in delivering this project. O'Neill said Papua New Guinea was a nation that was changing very fast. "As quality of life improves, the demand for a reliable supply of reliable power is one of those first priorities of a growing economy and a growing middle class," he said. "Also in many of our remote villages throughout the country, and in rural communities, more people have access to modern technology like computers and smart phones and they also need reliable power supplies. "In one generation we have moved from a traditional culture to become a modern economy. Our nation is now an energy exporter, we are active in global financial markets, and our agricultural products are exported around the world. "Around our country businesses continue to expand and require greater access to electricity, from the smallest business to major international corporations. "I thank ExxonMobil PNG for the leadership and support provided in resolving one of the most important challenges that Papua New Guinea faces as we seek to increase the reliability of supply of electricity. O'Neill said the completion of the power project was a result of a partnership between all stakeholders, Government, ExxonMobil PNG, Independent Public Business Corporation (IPBC), PNG National Petroleum Company (PNPC) and PNG Power Ltd.
"This truly has been a magnificent partnership, that we have displayed in making sure that we work with all stakeholders in ensuring that we have these project delivered on time," he said.